Monday's Molecule #43 is drosopterin, a major pigment in the eyes of the fruit fly, Drosophila melanogaster. The biochemical pathway shown below is an updated figure similar to one taken from an undergraduate lab manual where students identify the pigments by thin layer chromatography [Thin Layer Chromatography of Eye Pigments of Drosophila melanogaster]. There are two kinds of pigments required for the normal red eyes. The ommochrome pathway produces a brown pigment and the drosopterin pathway produces a bright red (scarlet) pigment. Both pigments are transported to the site of eye formation by a common transport system. The precursor of ommochrome is the amino acid tryptophan and the initial precursor in the drospterin pathway is the nucleoside guanine. Guanine and tryptophan need to be transported into the site of synthesis by specific membrane transporters. 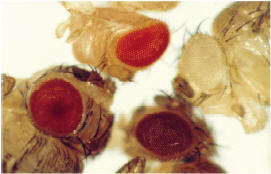 Mutations in the transport system block the transport of the pigments and result in flies with white eyes (left) and various other colors such as brown and scarlet. One of the proteins in the both the guanine and tryptophan transport system is the product of the white gene. Mutations in this gene result in white eyes because neither of the pigments is made. The other subunit of the guanine transporter is the product of the brown gene. 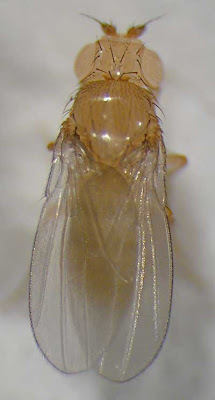 Defects in this gene will only affect synthesis of drosopterin and the resulting eyes will be brown. The second subunit of the tryptophan transporter is encoded by the scarlet gene. Defects in that gene will block production of the brown ommochrome pigment and give rise to scarlet eyes because only drsopterin is present. Examples of these three mutants are shown on the right from a paper by Mackenzie et al. (1999). The wild-type fly is the one at the lower left. Scarlet and white are on top and the brown mutant is in the lower right position. Four other eye color mutants, Punch, purple, sepia and clot disrupt the activities of enzymes in the pathway from guanine to drosopterin (Kim et al., 2006). Kim, H.J., Kang, C.H., Kim, Y.T., Sung, S.W., Kim, J.H., Lee, S.M., Yoo, C.G., Lee, C.T., Kim, Y.W., Han, S.K., Shim, Y.S., Yim, J.J. (2006) Identification and characteristics of the structural gene for the Drosophila eye colour mutant sepia, encoding PDA synthase, a member of the Omega class glutathione S-transferases. 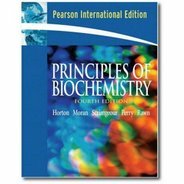 Biochem J. 398:451-460. Mackenzie, S.M., Brooker, M.R., Gill, T.R., Cox, G.B., Howells, A.J., Ewart, G.D. (1999)Mutations in the white gene of Drosophila melanogaster affecting ABC transporters that determine eye colouration. Biochim Biophys Acta. 1419:173-85. Why do D. melanogaster have red eyes? I'm asking about the evolutionary why - is red adaptive? Ah, memories of confused undergrads, so close to grasping the upside-down-and-backwards nature of gene names in Drosophila. 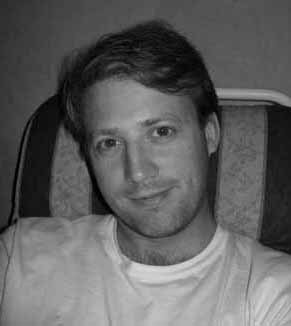 That lab experiment you cite is very similar to one I helped conduct in two semesters as a TA for a third-year genetics course at Simon Fraser University. It's a great little experiment to run in a lab. As for the evolutionary why... white-eyed flies are blind, suggesting to me that ommochromes and drosopterins are both involved in vision, perhaps as visual pigments that are chemically altered somehow upon impact of photons. I think of this as analogous to vertebrate visual pigments like rhodopsin. But I'm just speculating here. I'm sure it must be adaptive. It's probably related to the time when fruit flies were hunter-gatherer tribes on the African savannah. I think the fact that white-eyed flies are blind is much simpler than pteridines and ommochromes. Although they determine color yes, the fact the whole eye is white is why they are blind. They are white because they reflect all visable light and thus no light reaches receptors. This is why the human pupil is black, it absorbs all white/visable light. Simple physics. As to why red? Some insects are know to see in the UV spectrum or at least see better in the Blue-Violet range. So again Red eyes would reflect red light and allow more blue wavelength light to pass.